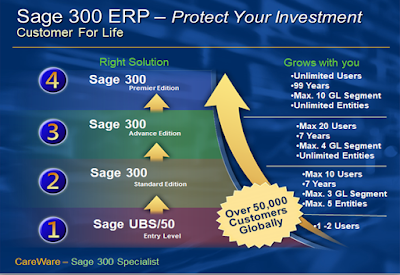 Why should I choose Sage 300 ERP? Businesses looking to purchase and implement an ERP system almost always find the process complex, time consuming and expensive. Evaluating a solution is never an easy exercise; much time and efforts have to be put in. demonstrations and discussions with solution partners and end users. We suggest that the right decision need to be made only once. You will not need to change your software every other year as in the case of the scenarios when a wrong or unwise selection has been made. The right decision can propel your business forward, while the wrong decision can be a costly handicap. So In evaluating a solution consideration has to be given on the longevity and growth path of the software and the company behind the software. Sage 300 is a business management software solution designed for medium-sized and small businesses. Critical program functionality includes support for accounting, distribution, manufacturing and project management tasks. With three Sage 300 editions to choose from, you don’t have to worry about outgrowing your system. When your business grows, and you need to add more users or capacity, just move up to a higher edition. Screens and modules are consistent between the editions, and data migration is a cinch—so you can forget about system downtime, and focuses on helping your business continue to thrive and grow. Sage 300’s object-oriented and multi-tiered architecture is what makes it so flexible. All three editions share the same architecture and code base, which makes it simple for you to upgrade your as your business grows, and yet retain the valuable history of transactions for your analysis. All Sage 300 editions offer the same flexibility: you choose the deployment options, the user interface and languages, the network environment or operating system, the add-on software developed by Sage Software or independent parties, and the features that help you operate more efficiently and profitably. One of the crucial ERP requirements is proper vendor selection apart from software selection. Many ERP failures can be traced to systems that don’t fit the needs of the business. For this reason, a rigorous approach to choosing your ERP system is essential to avoid common pitfalls and maximize the return on investment from the outset. However, most entrepreneurs don’t have the expertise, time or resources to manage a major system implementation initiative. So, it makes sense to get the help of an experienced, business partner who has the right domain experience be it in manufacturing or project that has a proven record of implementation, training and success. They can provide you with the knowledge and expertise you need to manage your ERP project. When considering an ERP implementation, make sure the training, scalability and vendor performance can meet your company's needs.